One year since the launch of the City of Chicago’s Vision Zero Action Plan, the Chicago Department of Transportation (CDOT) announced it is stepping up its efforts to improve the safety of all users of Chicago’s streets through a series of innovative data sharing initiatives that will allow the City to more accurately identify crash-prone locations and share crash data with the public. CDOT announced it has entered a data partnership with Arity, a subsidiary of The Allstate Corporation. At the same time, CDOT is launching a project to develop predictive crash technology, and the City is increasing transparency through its Open Data Portal by making crash data directly available to the public within days after a crash. The Vision Zero Chicago Action Plan, a data-driven, coordinated effort involving a dozen City departments that was launched by Mayor Rahm Emanuel in June 2017, set out a blueprint that will move Chicago toward the ultimate goal of eliminating deaths and serious injuries from traffic crashes by 2026. Vision Zero is based on an international movement that addresses traffic safety as a public health challenge. Arity is a connected car technology company founded by The Allstate Corporation in 2016 that collects nearly one billion miles of driving and connected car data per month from more than one million mobile phone and in-car devices. Arity has a unique, user centric view of a city’s mobility patterns and ability to identify driving behaviors that carry the most risk and cause severe traffic incidents. Leveraging Arity’s data and technology, CDOT will be building a foundation of insights and predictive analytics to better understand the risk factors of specific segments of roadways and intersections across Chicago. The partnership will help the City identify the risk factors on specific roadways and help determine where to best prioritize and focus investments in infrastructure and traffic safety resources, as well as how to tailor interventions to improve road safety in Chicago. CDOT also announced it is starting a project that will use machine learning, a form of artificial intelligence, to analyze multi-modal crash data and develop crash prediction technology. The project will use this technology to create probabilistic risk scores for every road in Chicago. The analysis will help identify the leading predictors of crashes and will help the City learn why crashes are happening, not just when and where. In addition, CDOT, the Department of Innovation and Technology and the Chicago Police Department today are unveiling a new set of data on the City’s Open Data Portal that will enable the public to directly access traffic crash data within days after a crash (see below for data portal links). Data from the City’s new electronic crash reporting system will show where crashes occur, the severity of the crash, and what contributed to the crash. The crash data will create a new level of public transparency for crash data and will support research by the public, academics and advocacy organizations to help in the effort to understand how crashes can be avoided. The data portal includes citywide crash data for Chicago starting in September 2017 (excluding interstate crashes). However, the portal also includes data for selected police districts as far back as 2015. The new electronic crash reporting system used by CPD was developed with National Highway Traffic Safety Administration (NHTSA) funds that CDOT received through the Illinois Department Transportation. The NHTSA grant also funded the upgrade of laptops in CPD squad cars. 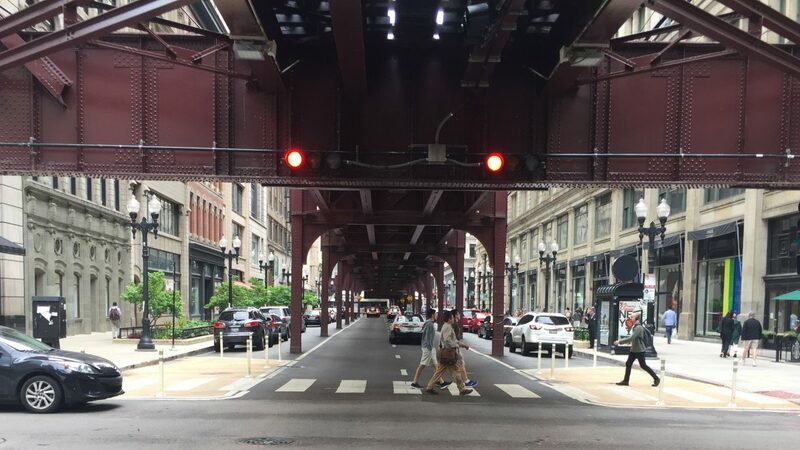 While Chicago and the nation have seen a downward trend in traffic crashes over the last decade, the trend has leveled off in recent years and the latest data shows a troubling uptick in pedestrian fatalities. More than 2,000 people are killed or seriously injured in traffic crashes in Chicago each year, with an average of five people seriously injured each day and one person killed every three days. Under the Vision Zero approach, traffic crashes that cause deaths and injuries are not accidents, they are preventable occurrences. The primary causes of traffic fatalities are five dangerous driving behaviors: speeding, failure to give the right of way, distracted driving, driving under the influence, and disobeying traffic signs and signals. Completed more than 90 pedestrian safety improvement projects toward the goal of 300 projects; with more than 200 such projects in the pipeline for 2018. Worked with the Chicago Transit Authority to plan pedestrian safety around 16 CTA stations that are expected to be completed this year as part of the federally funded Walk to Transit program, with plans for nine more stations in future years. Completed a High Crash Corridor Framework Plan that includes an assessment of infrastructure design needs in 43 High Crash Corridors identified through Vision Zero. The plan will guide CDOT’s investments in communities most severely affected by severe crashes. Installed 16 miles of new bikeways and restriped 22 miles of existing bikeways, with plans for 2018 to add 20 new miles of bikeways and restripe 20 miles; a notable example from 2017 was the Milwaukee Ave. safety project, which added dashed bike lanes, narrowed the vehicle lanes and reduced the speed limit on the corridor. The project also improved pedestrian safety by adding paint and post sidewalk extensions, high visibility crosswalks and eliminating two slip lanes. Worked toward building a culture of safety by directly reaching more than 115,000 residents at 800 outreach and education events. Tens of thousands more were reached through the City’s digital marketing Vision Zero campaign. Launched a focused outreach effort in the West side High Crash Areas, funded through a grant from the National Safety Council. Additional funding has been obtained for an outreach effort planned for the South Side. A Downtown Task Force addressing traffic safety issues in the Central Business District will kick off later this month. The City enacted a truck side guard ordinance that will add safety equipment to large vehicles in the City fleet and those used by City contractors, reducing the potential for pedestrian and bicyclist fatalities. The Vision Zero Chicago Action plan used crash data to identify 43 High Crash Corridors and eight High Crash Areas. Of the High Crash Areas, seven of the eight are on the West and South Side of the City and one is downtown, where the higher crash rate is correlated with higher density and higher volumes of vehicles and pedestrians. In addition, the data shows that people who live in areas of high economic hardship are three times as likely to die as a result of a traffic crash. Chicago was named one of 10 Vision Zero Focus Cities in the U.S. in 2016 and asked to participate in a new national program designed to advance Vision Zero. The approach recognizes that the challenges and opportunities to improve safe mobility are similar across cities. By collaborating closely with other Focus Cities, Chicago is part of a national and international effort to develop and share best practices aimed at eliminating traffic fatalities and severe injuries caused by traffic crashes. What is Arity? Founded by The Allstate Corporation, Arity is a mobility insights and solutions company focused on making transportation smarter, safer, and more useful for everyone. Arity combines the power of telematics, big data, and analytics to improve personal transportation by serving the entire transportation ecosystem – businesses, cities, governments, and consumers. The Arity Platform is built on more than 35 billion miles of historical driving and connected car data with more than a million active telematics connections. Arity transforms large amounts of data into actionable insights to help cities like Chicago better predict risk to help drivers be safer and smarter on their roads.